By Scott Gilfoid: Joseph Parker says he’s going to stop Dillian Whyte before Anthony Joshua did in knocking him out in the 7th round in 2015. Former WBO heavyweight champion Parker wants to smash the 30-year-old Whyte (23-1, 17 KOs) quickly this Saturday night on July 28 to make a statement to the boxing world in their fight at the sold out O2 Arena in London, England. Parker wants to knock Whyte out in a manner that will catch the attention of the entire boxing world on Saturday. The way for Parker to do that is to obliterate the loud-talking Whyte in one or two rounds. 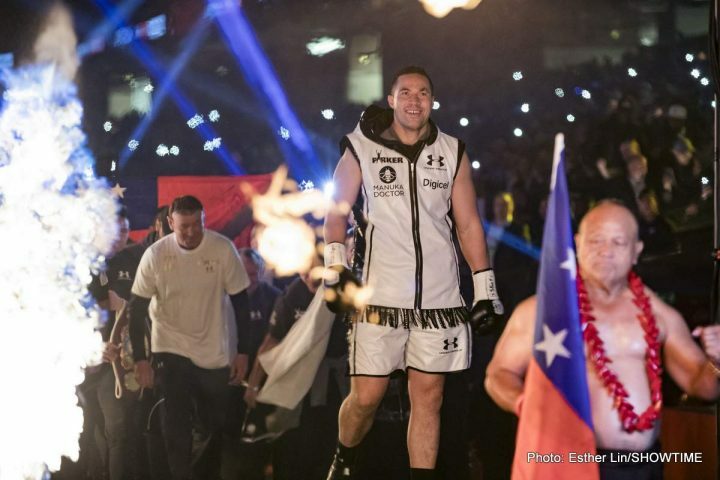 A knockout like that will leave no doubt in the minds of fans that Parker deserves the fight against Joshua on April 13 at Wembley Stadium instead of Whyte or ‘Big Baby’ Jarrell Miller. Looking for a fast knockout is a way for Parker to guarantee that he gets the ‘W’ against the Brit Whyte and doesn’t wind up getting the short end of the stick when it comes to scoring of the fight. “What’s AJ, seven, right? I’m going to knock him out earlier and I’m going to say, ‘And what AJ? And what?’ I think if I knock him out earlier, it will send a statement,” Parker said to skysports.com. I have to agree with the 26-year-old Parker. It will be a statement if Parker knocks Whyte out before Joshua did, but I think it would be a much bigger deal. For boxing fans that don’t remember that fight from 2015. Whyte suffered a bad shoulder injury in round two after staggering Joshua with a left hook that had him out on him his feet. After the 2nd round, Whyte’s left shoulder was out of order due to the injury, and he was basically a one-armed fighter for the remainder of the fight. Unlike Deontay Wilder, Whyte doesn’t have major punching power with his right hand. Whyte is little more than a slapper with his right. Whyte’s power comes from his left hook. Once he suffered the injury to his left hook against Joshua, he was basically eating out of AJ’s hand until being stopped in the 7th. If this were Deontay that injured his left shoulder, he likely would have poleaxed Joshua with a right hand bomb in round three, as AJ was badly gassed out from the previous round. Unfortunately for Whyte, he can’t punch his way through a wet paper bag with his right hand, and he was a sitting duck against Joshua once his left shoulder was put out of commission after the 2nd round. As such, if Parker stops a HEALTHY Whyte inside seven rounds, it would say something that he’s a better fighter than Joshua. A win brutal knockout win for Parker over Whyte will put tremendous pressure on Joshua’s promoter Eddie Hearn to make the Joshua-Parker rematch on April 13 at Wembley Stadium. Right now, Hearn is chomping at the bit to stick Whyte or Jarrell ‘Big Baby’ Miller in with Joshua on that date. Parker and Deontay have an outside chance of getting the fight against Joshua. Parker likely needs a devastating highlight reel knockout of Whyte within three rounds to get the Joshua fight on April 13, whereas Wilder will need to accept the $15 million flat fee offer given to him by Hearn. Whyte is rated #1 by the World Boxing Council, but he’s been given that rating by beating the likes of Malcolm Tann, Ivica Bacurin, Ian Lewison, Robert Helenius, ‘Big Daddy’ Lucas Browne, Dave Allen and Dereck Chisora. It goes without saying that Whyte has been matched softly by his promoter Eddie Hearn since he was obliterated by Joshua in seven rounds in 2015. Finally after three years of soft matches, Whyte will be stepping it up against his first talented opponent since his disastrous performance against Joshua. Parker-Whyte will be shown live on Sky Box Office PPV this Saturday night in the UK at the O2 Arena in London, England. Parker lost his last fight to Joshua by a 12 round unanimous decision on March 31 in Cardiff, Wales. Parker had Joshua hurt a couple of times in the fight after hitting him with right hands on the chin. Parker getting a victory over Whyte will be a nice confidence booster for the New Zealand fighter. Considering that Hearn seems to be more interested in sticking one of his own Matchroom stable fighters in with Joshua on April 13, Parker probably won’t get the fight even if he destroys Whyte in the 1st round. But at least if Parker eradicates Whyte in short order on Saturday, he’ll make Hearn look bad when he sticks Miller or Whyte in with Joshua on April 13. The boxing world are going to see Hearn as protecting Joshua if he matches him against Whyte or Miller instead of Parker or Deontay on April 13. Whyte, 30, has only one loss on his resume as a pro during his seven-year pro career, and that was his loss to Joshua in 2015. However, Whyte does have a very, very controversial 12 round split decision win over Dereck Chisora in their fight in December 2016. Whyte lost that fight in the eyes of many boxing fans. Whyte was the A-aide on a Hearn promoted card, which clearly put Chisora in a bad position where he probably needed a couple knockdowns to have a chance to get the victory. Parker is in the same boat as Chisora was in fighting Whyte in a Matchroom promoted card. That’s why it’s in Parker’s best interest to knock Whyte out in order to make sure he doesn’t end up like Chisora in losing a controversial decision to the home team. Parker says he’s not going to hound Joshua for a rematch after he knocks Whyte out on Saturday night, because he doesn’t want to come off like he’s desperate for the second fight. “There’s no point walking over and going, ‘Hey,’ you just look like a desperate guy. Just let it pan out,” Parker said. I totally agree with Parker. He would look pathetic if he walks up to Joshua and starts pleading for a rematch after he decimates Whyte in the early rounds. If anything, a move like that would likely harden Joshua’s resistance in giving Parker a rematch. Joshua doesn’t seem to want any part of facing Parker a second time after his bad showing against the talented New Zealander land March, and you can’t blame him. With a different referee working the fight, Joshua might have lost.